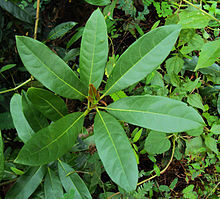 Persea est genus 150 specierum arborum sempervirentium familiae Lauracearum. Notissima generis species est Persea americana, late in regionibus subtropicis proper eius fructus magnos et edules culta. Genus Persea in tria subgenera digeritur. Machilus, subgenus Asianum, in Machilo, genere separato, multis auctoribus tractatur. Subgenus Persea—Media America. Duae species. Philippus Miller vocabulum persea a Περσέα Graeco derivavit. A Theophrasto et Hippocrate arbori Aegyptae incertae, fortasse Cordiae myxae vel speciei Mimusopi adhibere solebatur. ↑ 3.0 3.1 "GRIN Species Records of Persea". Germplasm Resources Information Network. United States Department of Agriculture . Hogan, C. Michael. 2008. Chilean Wine Palm: Jubaea chilensis. GlobalTwitcher.com, ed. Nicklas Stromberg. Kostermans, André Joseph Guillaume Henri. 1993. Mutisiopersea Kostermans, a new genus in Lauraceae. Rheedea 3: 132–135. Kopp, Lucille. 1966. A taxonomic revision of the genus Persea in the Western Hemisphere (Persea-Lauracese). Memoirs of the New York Botanical Garden 14(1):1–117. Quattrocchi, Umberto. 2000. CRC World Dictionary of Plant Names, vol. 3, M-Q. CRC Press. ISBN 9780849326776. Vicimedia Communia plura habent quae ad Perseam spectant. De Persea americana et omni genere, praecipue subgenera Persea et Eriodaphne. avocadosource.com. Persea. Flora of North America. efloras.org. Machilus. Flora of China. efloras.org. Novissima mutatio die 22 Decembris 2016 hora 16:26 facta.